The most commonly seen type of video ads, that people are familiar with, are the linear video ads which play in the video player before, during or after a piece of video content. 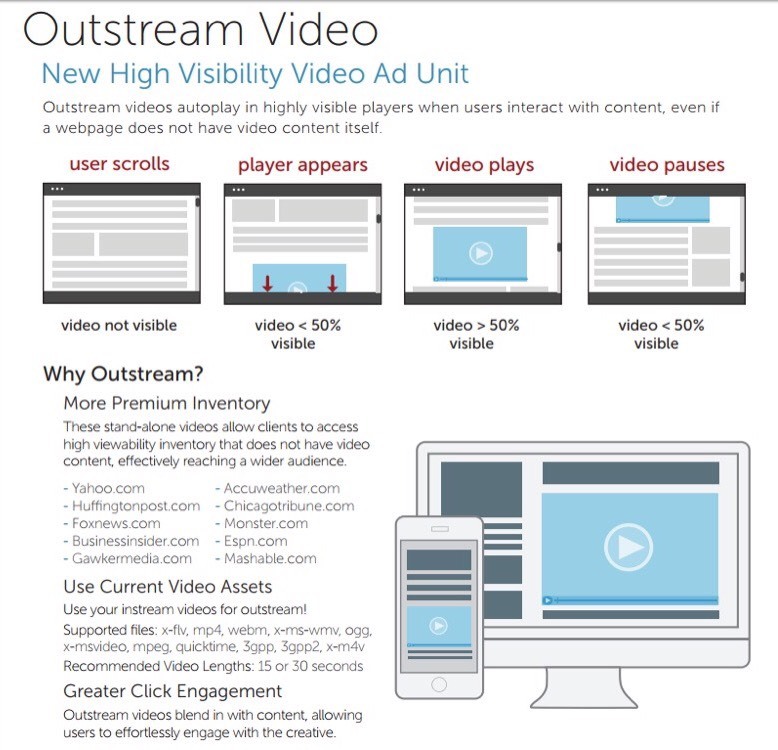 All of the in-stream ads are played within the main video player where the actual content will be viewed. Linear ads take over the entire video player space. They’re linear because they run in line sequentially with the content. They can be divided into pre-roll, mid-roll and post-roll depending on when it plays during the content. Linear ads are usually 15-30 second clips, so try to keep them within 30s. Do not allow fast forward. You can use either 16:9 or 4:3 ratio for these ads. However, 16:9 is the most commonly used ratio. This ad runs before video content is viewed. This is a major advantage because viewers are forced to watch the ad before they see the content. This is also a disadvantage because users can sometimes choose to skip the ad. This ad plays while the video content is being viewed. The video content pauses in the background, and resumes after the ad stops playing. You need to time the ad well to make it seem like it fits with the content being viewed. This ad receives the maximum views because viewers rarely quit watching video content in spite of such intrusive ads. This ad is played after video content has stopped playing. It receives the least views because video viewers have no motivation to watch it. Using this to your advantage, you can add a CTA to these ads and redirect viewers to your website/landing page or show them another video to increase engagement. You can also make interactive linear ads and give an option to your viewer to perform certain actions like clicking for more information, signing up for a newsletter, locating a store, etc. You can use videos, animations or static images along with interactive elements, like buttons, with a CTA. Non-Linear ads run simultaneously with video content.Clicking these ads pauses the video content. You can either show a full player ad or redirect the user to your website when these ads are clicked. These ads are categorised into overlay and non-overlay ads. Reduce the ad’s size after 5-10 seconds so as to not cover the video content. Provide a close (x) button to close the ad. Overlay ads run on top of the video content. These usually only cover the bottom 20% of the video content to avoid obstruction. You can use these ads as a persistent brand or product reminder while the content is played. The disadvantage of these ads is that they could cover important information like subtitles, captions or other information in the video. Wayfair’s shoppable ads nabbed 3x more revenue than YouTube’s standard spots. These ads run concurrently with the video content in the video player instead of overlaying it. You can use these ads as an invitation to interact with your brand or other video content. The upside is that no part of the video content is obstructed. A possible disadvantage is that the visuals in the video ad could be distracting and may annoy your viewers. Out-stream ads are videos that aren’t accompanied by any other content. While you need to wrap your linear ads around elements such as a different video or a blog post, an out-stream ad doesn’t need to be tied to anything. It is non-intrusive. You can simply scroll down if you do not want to see the video. Advertisers can expand their reach beyond video players. You can publish videos in all kinds of content, even editorial pieces. Out-stream videos tend to build Brand Awareness, drive online purchases, target key consumers and even extend TV campaign reach. Publishers don’t have to host the video content on their website, they can do so within the text itself. Out-stream ads launch only when a user action takes place on the page. These actions cannot be faked by bots. Thus, brands don’t need to worry about ad fraud. Out-stream ads can be categorised into in-page, in-banner and in-text ads. These ads are embedded video players that are specifically there to show a video ad. You will require a good amount of space on a web page to run these. Some ad networks, however, offer smaller placements as well. You can place these ads on a page without a main video player or other streaming content. Collapsible in-banner ads start as a larger area of the web page and shrink down to the standard banner size either automatically or through user interaction. Expandable in-banner ads start as the standard banner size playing the video, but offer the user an option to expand the video and watch in a larger area, overlaying the content on the web page. Imagine you’re reading an article about outdoor camping. As you scroll, a video player opens (usually somewhere between two paragraphs) which autoplays a video showing you the brand new model of a tent that is weather resistant and accommodates 4 adults. This is triggered when you navigate to the ad element within the text content. As you scroll further, the video pauses on its own. This is an in-text video ad. Interactive ads are the best type of video ads that you can use to increase engagement. These ads take over the entire screen of whatever device your user is accessing, and pause the video content. You can add different activities that the user can perform – such as signing up to a newsletter, visiting a store, or clicking for more information. Keep the ads limited to 30s only. 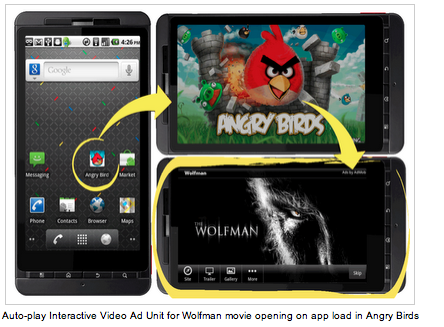 Place interactive ads either before or after the primary video content, not during. You can use these video ads while the game is loading or in-between levels. This is a good way to monetize your game without charging the players. These ads can be often seen in online, social and mobile games. These ads don’t really disrupt the gamer experience as they are shown during required pauses in the game. Offer gamers the chance to earn new lives, extra tokens or bonus items, depending on your game. Visit Rocketium to make your first video ad NOW!